As a storyteller you have to know what medium you are capable of writing for, and what medium will showcase your story best. As a storyteller you have to not only understand the differences between each medium, but also know what medium you are capable of writing for, and what medium will showcase your story best. Never waste your talent or the time of others by working on a medium that you have no passion for, or are not familiar with. As a storyteller you can explore your creative talent by writing poetry, a novel, or short story that will be on every best-seller list in the world. You can write the play everyone will talk about; a screenplay that will warrant the attention and commitment of filmmakers, and hopefully be seen by 600 – 800 million people worldwide; or a script for television that will prevent viewers from flicking the channels. For all their similarities (character, story, etc), plays novels and films have divergent histories with various traditions and conventions, requiring unique talents of a specific storyteller. Novelists and journalists write for the page: When you are writing a story and your creative expression is mostly about thoughts, dreams and memories, you are writing a novel. Screenwriters write for the screen: When you are writing a story and your creative expression is visual, filled with pictures and images, you are writing for a visual medium – it could be screenplay or for television. Playwrights write for the stage: When you are writing a story and your creative expression is verbal, mostly filled with dialogue and expressive language, you are writing a play. In essence, the same discipline, motivation and creative process govern all creative expression. It is only the structure and format that differs. All forms of writing involve characters, dialogue and descriptive action. 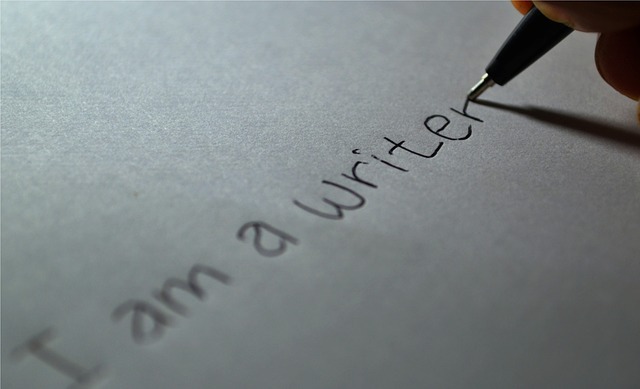 Whatever has been said or written about the experience of writing from the beginning of time, it still boils down to one thing: Writing is your own, personal experience. Nobody else’s. Writing is an amazing, almost mysterious phenomenon. IF the STORY you are writing happens in PICTURES, you are writing a screenplay, or for television. IF the STORY you are writing happens in WORDS, you are writing a stageplay. IF the STORY you are writing happens in THOUGHTS and ABSTRACT EXPRESSIONS, you are writing a NOVEL or SHORT STORY. The novelist creates and describes everything that appears in the novel — the characters, the emotions of the characters, their actions, their thoughts, the plot, the costumes, the atmosphere, the environments, etc. The screenwriter creates everything that would become part of a film; a producer will finance the film; a director will direct the action; production and costume designers will design the costumes and sets; a cinematographer will operate the camera; the special and visual effects teams will create the special effects, and so on – all things which novelists would do on their own. The novelist is a primary creative artist who transforms imaginary or artistically treated true stories into a fictionalised form of varying lengths from the novella to the epic and beyond and can be up to 350 pages or several volumes A feature film is generally somewhere in the neighborhood of two hours long and the screenplay will be 120 pages – when the film is completed it could have a running time between 88 to 120 minutes. Films under 76 minutes are regarded as short films. The novelist is a one man or woman band doing everything themselves. The screenwriter delegates many responsibilities to others. The screenwriter is definitely not the primary creative artist on a film (unless they also get to direct, produce and executive produce) – and they are often not even allowed on the set. They decide what goes on paper and that’s about it. The director decides what goes on film, which is far more significant. But let’s not forget the producer because he decides who gets to direct. And the actors pretty much do their own thing, at least as far as the writer is concerned. The novel is, by the way, also a visual medium, except that the author uses words to help the reader reconstruct the visual images in their head. A screenplay is one facet of a multi-faceted, collaborative artistic endeavor which is governed by someone else and contains lots of dialogue, descriptions of the action (which is divided up into scenes and shots), sparse descriptions of the characters and their emotions, the locations, camera angles, costumes, etc. The novelist is a primary creative artist, doesn’t have these problems. Once you find a publisher and are working with an editor, you are much more likely to end up with something that is close to your original idea. Plus there are many more niche markets available to novelists. You don’t have to write to please a general audience or some studio executive who thinks you should be writing to please males between the ages of 18 to 25 or females between the ages 12 and 22. In any case, when you, as the novelist, pick up pencil and paper or sit down to your computer to write a novel, you already have the money, so to speak. You don’t need someone else to put up forty million dollars so you can actually create it. And you don’t need a high powered agent. You are the head of the studio, the screenwriter, the director, the primary creative artist. You make all of the decisions and conjure everything yourself down to the last detail, including all the leads. And when you’re done, the finished novel is a finished work of art. The screenplay, including a screenplay written by William Shakespeare, is only a suggestion to higher-ups. The producer and then the director get to decide what parts of the script they will use and what parts they will throw away – and what parts they will let someone else rewrite. In other words, you can easily end up being the first of many writers and live to see your script completely changed and perhaps even totally ruined. Then, to add insult to injury, if it doesn’t go straight to video and does finally reach the big screen, you may end up getting no credit at all. Having a finished novel under your arm looking for a publisher is the equivalent of having a finished film under your arm looking for a distributor. And there are very few middlemen between you and your book deal. Even some of the top Eastern agents will respond to your query letters and ask to look at the first two chapters. You can also approach many publishers on your own, even without an agent, if you can present yourself in a credible manner and write a good query letter. If you’re a new screenwriter – i.e. not a professional working writer who already has good credits and an agent – it is very difficult to approach the studios or major independent companies on your own without having an agent or good contacts on the inside. They both have the same underlying story structure. The same story principles apply to both. And, in fact, the screenplay can be an excellent first draft for a novel. The forms of both are different but the underlying principles and structures are the same. From inspiration to last draft you may need as much time to write a screenplay as to write a novel. Screen and prose writers create the same density of world, character and story. Prose writers fill pages as fast as they can type, screenwriters cut and cut again, ruthless in their desire to express the absolute maximum in the fewest possible words. For the screenwriter economy is the key. The screenwriter cannot, like the novelist (in authorial voice), or the playwright (in soliloquy), hide behind his words. The screenwriter cannot smooth a coating of explanatory or emotive language over cracks in the logic, blotchy motivation, or colourless emotion and simply tell us what to think and how to feel. The camera is the dread X-ray machine of all things false. It magnifies life many times over, and then strips naked very weak or phony story turn. Story is at the heart of all the different media and all the different genres and if you plan to write novels or write, direct or produce story films, it is important that you learn as much about story as you can. There are six billion people in the world with a desperate need for real stories which isn’t being met, and if you take the trouble to learn what a story really is, it will give you a tremendous advantage. It is a piece of literature written to be performed in front of an audience, and can be read and acted. You are writing for the stage, a three-dimensional space encompassing live action performed by human beings. Filmmaking is a neurotic job; it’s abnormal to every creative process I know. In theatre the creative process is natural, not so neurotic. When you are the film director who has written the screenplay yourself, you have to be some sort of Dr. Jekyll and Mr. Hyde, because if Dr. Jekyll has written the screenplay Mr. Hyde has to direct it, and I tell you they don’t like each other that well. I think it’s a very schizophrenic situation. In the theatre; we are a group of artists who just come together – it’s fantastic; we come together in a house that is built for us to work in. What do such movies as The Hours, Shakespeare in Love, Empire of the Sun, Wag the Dog and The Untouchables have in common? Each of these movies—and we’re talking about some very good films—were written by a playwright: David Hare (The Hours), Tom Stoppard (Shakespeare in Love and Empire of the Sun) and David Mamet (Wag the Dog and The Untouchables). At first glance, plays and screenplays seem very different. Plays are, at least to the untrained eye, mostly composed of people sitting (or standing) around and talking. In many cases, everything happens in one place. People may go in or out, but the general perception of plays is that it’s all about the words. In a screenplay you can call for car chases, vast battles, settings that change with the click of a button—and the general perception is that it’s all (or at least mostly) about the visuals. Despite the obvious differences in the final product, playwriting and screenwriting are closely related forms of dramatic writing. Tennis players improve their games by playing basketball. Actors improve their acting by studying psychology. Football stars take ballet. So if you’re writing screenplays, why not cross-train by writing for the stage? Playwriting is a fantastic medium for screenwriters who want to get rid of all the spoken words in their screenplays. You must know your medium: the theatre. If you are a constant movie watcher, don’t write plays. To write truly effective theatre, you must immerse yourself in the medium. Go to your local community theatre and volunteer to work backstage, or even just go to watch some rehearsals. Learn the limitations of space and live action, learn that less is often more in the theatre, learn that someone cannot turn into a werewolf in 5 minutes during the play and that they need time for make up. The more you know about theatre before you sit down to write your play, the better equipped you will be to begin. There has never been a better time to try to become a television scriptwriter. Television is always looking for new writers. Writing for television today has no stigmas. All the big filmmakers have their finger in the lucrative TV pie: Barry Levinson’s Homicide, Steven Spielberg’s High Incident, and Michael Crichton’s E.R have garnered critical acclaim. There’s more opportunity than ever for newcomers. In addition to substantial financial rewards, television provides excellent discipline for beginners. The competitive demands of art and commerce create an environment that makes it one of the best possible training grounds for the writer who is serious about developing his craft. Writing for television requires not only facility with words and skill with structure, but an acute sensitivity regarding people and how they behave. Television demands more of its writers than most other mediums; the writer must do mote than captivate an audience, the writer must captivate a mass audience. Television is about entertainment; every television drama – however literary or demanding its subject – must aim to satisfy millions of viewers. Films made for television – Approximately 120 minutes long, usually adapted from plays, novels, short stories, true stories, etc. Usually, and generally consisting of six to eight acts of equal length. The usual length is 101 to 110 pages, screenplay format. Episodic comedy or sitcom – 30 minutes long, an episode usually consists of two acts or a teaser followed by two acts, or two acts followed by a tag. The usual length: 26 pages for a show on film, 42 for a show shot on tape. Episodic drama – Each episode is 60 minutes long, consisting of four acts or, in some cases, four acts and a teaser and/or a tag. The average length is 48 to 54 pages. Tele-serial – Daily soap operas that are at the most 30 minutes long. Reality television and game shows – Game shows can either be quiz-type shows such as ‘The Weakest Link’, or set in real-life situations such as ‘Survivor’ or ‘Big Brother’. Writing documentaries is one of the most prolific choices in the field of writing; it affords the writer the opportunity to write passionately about a subject that is close to home; it also gives the writer an opportunity to explore new worlds. In researching your subject matter you will find that the excess material will lend itself to a short story, or even a feature film. Always use all the information you find and sift it through the appropriate medium. Documentaries work on the same principle as feature films; give your audience a fascinating character that is intriguing and evokes empathy. Use the journey of the character as the arc of your documentary and you will hold the interest of the audience. The story must have a focused proposition that is well structured. It is essential to have a strong central character that carries and moves the story forward. The subject must focus on people. The canvas, on which the story is told, could span a wide of subjects including history, arts, politics, sport, etc. Issue driven pieces, current affairs and experimental documentaries are not suitable. The subject can also focus on animals, wild life, nature. The location must reflect the broad geographical and cultural landscape of South Africa. The dramatic impact of documentaries is increased when the filmmaker blends fiction and fact by dramatising historical events through re-creating the events by using actors. Write it from the gut. Write it the way you feel. The one thing I notice about the writer’s first or second screenplay is that they tend to write it with an image of what it should be. When you get into the mimetic quality of paralleling what you think is a Hollywood film; you somehow lose the essence of yourself. Storytelling is a prolific art form that rivals all other activities such as work, play and exercise during the hours we are awake. You will tell and take in stories as much as you sleep, and even when you are dreaming. As a screenwriter you are a storyteller who happens to write for the film medium. Film is a visual medium that dramatises a basic story line. It deals in pictures, images and pieces of film. Screenwriting done well is an art, but it always begins as a craft. The craft of screenwriting is something that can be learned. How good or bad it is, that’s another story. It is an ongoing creative process that will end weeks, months, perhaps years later with some 120 pages filled with vivid images, words, dialogue, description, memorable characters and action in what is called a draft. The draft will be read, re-written and when it is as good as you think it can be, the draft becomes a spec screenplay that is ready for the hungry market place; a spec script that will evoke the vision of imminent filmmakers and affluent producers, and hopefully satisfy the ferocious appetite of filmgoers worldwide. As a screenwriter, you are part of a broad storytelling tradition. As a screenwriter, you are half a filmmaker. The mistake most beginning screenwriters make is to think that they are writing a ‘film’. You are not writing a film, you are writing screenplay that becomes the blueprint for a film. A screenplay is writing intended to be turned into a film: 120 pages filled with vivid images (visual narrative), words, dialogue, description, memorable characters and action. Film is a visual medium that dramatises a basic story line and deals in pictures, images and bits and pieces of film. A script written for the screen is a story that is told in pictures; it deals with visual images, with external details. A screenplay is a guide, an outline for a feature film. It is a blueprint, a series of images, scenes or sequences that are formatted in the traditional style of screenplay writing. It is not a novel and it is not a play, although it combines elements of both. Importantly, it is also not a film, but eventually words will be turned into action and the story will be immortalised on film or disc. A screenplay is a unique breed of animal that is fun for the storyteller to tame, and exciting to master. The director will come up with a whole new vision. Remember that the screenwriter writes the screenplay and the director writes the film. Actors will change the dialogue during the workshop and rehearsal processes. That’s why it is important to read screenplays to study the craft of writing and not only watch films because there is a world of difference between the writing and turning words into action. The editor will concoct another way to order the scenes and tell the story. Remember that a film gets made three times: in the writing, production (when the film gets shot), and in pre-production (after filming is done). IT WON’T BE YOUR STORY ANYMORE! It is senseless to write a screenplay if it isn’t going to get produced. The screenplay forms an important part of the ‘package’ and is the first vital element in the movie business. PACKAGE: The material: a book, screenplay, story outline, or concept. Show business is a business. This said, it is important to keep in mind that very few people go into the film industry because they want to make money. You might as well be selling Porche’s or be a clerk at a store. Everyone in the business got into it because they love films. Everyone is trying to make good films. Although not all are trying to make art, most of them would rather make a film that will last. Our next workshop for screenwriters takes place in Cape Town in January 2016. The workshop is also presented as a correspondence course. Creative writing is writing that uses language in imaginative and bold ways. When you write you communicate a message to the reader/audience. The message, or content, can be presented in a variety of ways. Narration: Writing that tells a story. Real-life narratives are memoirs, biographies, autobiographies, journals, diaries and screenplays. Fictional narrative is short stories, novels, myths, legends, narrative poems, and screenplays. Drama or playwriting could be considered a type of narration but it is classified as its own genre. There are three genres, or types if writing in literature: Prose, drama and poetry. Description: Writing that creates a word picture of what something or someone is like. The description is made up of sensory details that help readers form pictures in their minds. Poetry is pure descriptive writing. Description also uses images, words that appeal to one or more of our five senses. Exposition: Writing that explains, shows or tells about a subject. It is the most common of everyday writing: news articles, memos, letters, manuals, recipes, business reports, term papers, research reports, shopping notes. Persuasion: Writing that tries to move an audience to thought or action: newspaper editorials, advertisements, letters to the editor. cover letters, résumés. Non-fiction: writing about real people and events: memoirs, essays, biographies, autobiographies, articles. Fiction supplies the only philosophy that many readers know. It establishes readers’ ethical, social and material standards, confirms readers in their prejudices, and opens readers’ minds to a wider world. Short Story: A brief work of fiction. It has a plot, conflict, characters, setting and dialogue. Unlike the novel it focuses on no more than two characters and a single event.